California’s assisted suicide act went into effect last year, and today the Department of Public Health released statistics for 2016. A total of 191 people requested prescriptions for aid-in-dying drugs, and 111 used them. However, because the program is very new, and only covered half the year, these numbers are certain to go up significantly in future years. 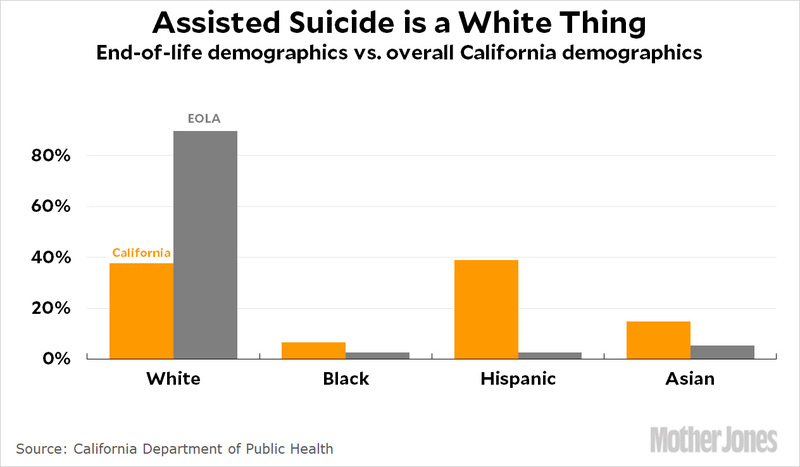 Unsurprisingly, the initial statistics confirm what we know from other states that have similar laws: assisted suicide is barely used at all among non-whites. The reasons for this are not entirely clear. Among Hispanics, it’s probably partly related to religion, since the majority of Hispanics are Catholics and the church forbids suicide. More generally, it’s probably also related to a distrust of doctors among minority groups. Beyond that, I’m not sure anyone really has a persuasive explanation. Generally speaking, though, the main demographic for assisted suicide is professional, college-educated white folks who are used to being in charge and dislike the idea of losing control over their lives. This was true in the 90s and aughts, when it was illegal and done under the table, and I believe it’s true in every state that’s legalized assisted suicide since then. There’s still a considerable racial disparity, but it’s somewhat less dramatic than it is when comparing to all age groups.